Raining Nickels and Dimes . . .
No one seems to know exactly where the $2.6 Million from New Hartford's "Rainy Day" fund went, but Cathy at NH Online Blog documents where at least some of NH's outlandish spending has gone by posting the invoices from the Town Attorney and the CPA firm hired to assist the Town with its finances. On the Town Attorney's invoices, I was struck by the number of entries "Memo to Town Board: DC Powerline - NYRI" and similar wording re the NYRI situation. I counted about 40 such entries between 1/1/2008 and 6/30/2008 alone, totalling 7.9 hours or $1185 at the attorney's $150 hourly rate before I stopped because I got tired of counting. A quick scan, however, revealed that the pattern continued for the rest of the year and into 2009. That's a lot of memos! NYRI was an important issue, and the action before the Public Service Commission generated a lot of paper (I have boxes of it). But WHY would the Town Attorney be writing memos to the Town Board on NYRI? There is no evidence that he actually did anything in particular in representing the Town on this issue. The Town's interests were represented by the Gilberti firm out of Syracuse through the Town's participation with Communities Against Regional Interconnect. Although his name appears on the official PSC service list to receive official documents, so does that of the Town Clerk, so the Town was always kept informed directly by the PSC and all the other parties of their actions ... so why the need for constant memos? FOILing the memos should be an interesting experience if anyone wants to try. It will probably result in a response that it is protected by Attorney-Client privilege . . . but the Client (in this case the Town Board) can always waive that. Will the Town Board demonstrate that it obtained useful information from the money paid to the Town Attorney? In this regard it is interesting to note that the Town Board is mostly Republican and that the Town Attorney is also the Chairman of the Town's Republican Committee, wielding a lot of influence over which candidates for Town Council and Supervisor receive Party endorsement. There appears to be a pattern of "nickle-and-dimeing" of the Town Taxpayers by the Town Attorney for services re NYRI, the value of which is not evident on the record. I'll leave it to others to see if the pattern prevails on other issues. Nickels and Dimes add up. The Agreement . . . The fighting has to end, once and for all. Negotiating a settlement of disputes with the Oneida Nation is better than having one shoved down our throats by the courts or by the Bureau of Indian Affairs. But is the proposed Agreement between the Oneida Nation and Oneida County the settlement we need? While several of my friends will disagree with me, I see the Oneida Nation operations as good for the area. There are negatives, of course, like there are with any enterprise, but it seems to be a net positive (and if there are some stats indicating otherwise I certainly want to see them because they should be aired). It is one of our biggest employers - a major job creator, employing many people who otherwise would have moved on to other regions -- people who pay taxes. It is a "class act," with venues on a par with some of the best entertainment, gaming and golfing venues nationwide. It is also our biggest tourist draw, and puts a positive face on the region for the national spotlight. It is also competent -- refreshing to see in a region where few things seem to be run right. As for the Agreement itself, it seems to be mainly about something that the Nation has plenty of: MONEY. Proponents of the Agreement see Big Money for County and Local Government . . . They can't wait to get their hands on it. . . . "to stabilize taxes." Opponents say it's Not Enough. Frankly, the whining out of the Vernon-Verona-Sherrill School District about how they are being shortchanged and how they need more money "for the children" is sickening. If the Nation didn't exist, would they be better off? The Nation imposes Zero impact on the school district, yet it employs many people who live in the district, enabling them to pay taxes to the district. We The People have seen all this before. Big Money for the water deal in Utica did not solve Utica's money problems but created an entity that focuses on its own existence at the expense of regional needs. Big Money for schools created a lot of construction projects, but also bought a lot of distractions, and has not resulted in a better educated population. Big Money for job creation has created a few jobs (especially among bureaucrats), but most of the good jobs continued to leave the state. This agreement is not like settling a car accident. MONEY SHOULD NOT BE THE KEY FOCUS although money, on issues such as "tax parity," is certainly involved. What appears to be going on in the Agreement is a mini-version of the act now playing on the national stage: Big Enterprise and Big Government defining their relationships, while the needs of the "every-day" person, the ones who ultimately pay for whatever "deals"are worked out, get overlooked. If the Agreement gets passed, once all the Big Money is spent, what are we left with? What will our lives be like? The Agreement is woefully inadequate at defining the relationships between the Nation and the rest of us. For that reason, it MUST BE REJECTED. Being Railroaded . . .
A couple stories appeared this week about Amtrak CEO Boardman's talk to the Rome Chamber, one in the OD, the other in the Sentinel. Mr. Boardman, who lives in Rome, wants to see a high-speed rail stop in Rome, as well as Utica. Could Herkimer and Little Falls be far behind? Weren't they originally planning to go from Albany to Syracuse with no stop in Utica? "It’s what you need here for the future," said Boardman of Rome’s station. "You need frequency." But Rome also needs support from the state, because no system makes money, so there has to be public money to support the operations of the system built to serve passengers. No system makes money? Public money must support operations? If the system will not be able to sustain itself, then what need could it possibly be filling that is not already being met by other means? Why are all these officials pushing for something that is not needed? And not pushing for something that IS needed (merely to put us on a par with the rest of the country): Removal of the Thruway Tolls? "Based on current water use, this ruling provides sufficient room to, at the very least, allow us to move forward and address the immediate needs of the towns that have requested water permits," authority Executive Director Patrick Becher said. "And this decision clears the way for the state now to provide drinking water to people who need it without fear of litigation.” . . .
Assemblyman David Townsend, R-Sylvan Beach, said despite the ruling, water line expansion should be possible in Westmoreland, Kirkland and Schuyler, since that water is already accounted for. “I believe there was always enough water to do those,” he said. OH REALLY? -- Let's put this 22.6 MGD in perspective. 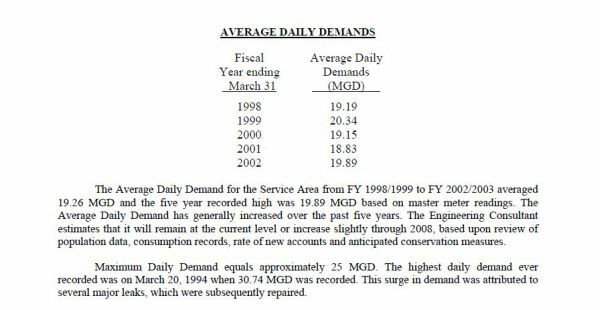 While Average Daily Demand equals about 19 MGD (this blogger has seen higher numbers in MVWA engineering reports) Maximum Daily Demand equals 25 MGD -- or 38.68 CFS -- which would exceed Judge Hester's Order. Perhaps there is enough storage in the MVWA system to handle the Maximum Demand days to avoid drawing more than 35 cfs from Hinckley . . . but it seems too close for comfort. What should be clear is that while Messrs. Becher and Townsend would like extend water service to NEW areas allowing people to get off wells, that will leave NO WATER for increased use in the areas that MVWA already serves. If water is supplied to new housing developments what is left for industrial development? We can kiss the Marcy Nanocenter "Goodbye" because where oh where would we get the extra 3 MGD it would need to operate? Of particular concern, Oneida County Executive Anthony Picente said, is what happens to the authority's plans to extend water lines into potential growth areas in Kirkland, Westmoreland and western Oneida County. The authority has also hoped to extend water lines eastward into the Herkimer County towns of Frankfort and Schuyler. Mr. Picente's concern is misplaced. The county already has a study (done in 1968 by Malcolm Pirnie) that shows that Non-Hinckley water resources are available to supply significant growth in central and western Oneida County, and recommends that they be used. That same study, however, shows that there are almost no water supply alternatives available for Utica and its Suburbs other than Hinckley. Congratulations MVWA! Your actions have doomed Greater Utica to NO GROWTH. Divided We Fail . . . In the conversation following yesterday's post on New Hartford's fiscal foolery I suggested that the Town should become part of Utica because town leaders had been trying to make NH a city for years, duplicating what was next door and eliminating the suburb that people moved to NH for. Utica provided enough government for 100,000 people -- and that is about what is left in Utica+NH+Whitestown now. One government for all three to me is a no-brainer. Strikeslip surely jests. New Hartford people may be fat and lazy when it comes to government involvement but they are not stupid. The incompetency and corruption in NH pales to that of Utica. Why, Utica produces so called leaders who can't produce two coherent sentences together." 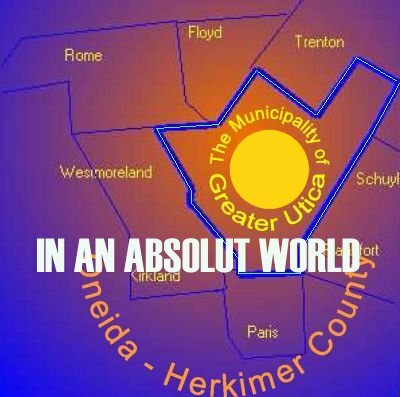 One goverment for three" sounds good but is an undesirable, pipe dream given Utica and its political players. Utica may have had years of incompetent leadership -- but why would that not be expected? The region's most capable people are most likely to live in the "better" neighborhoods -- which are in the Suburbs. But (given NH's latest fiasco) we don't seem to have competent people running for Village or Town offices either. If you were a successful and capable person would you want to put up with the petty small-town politics that is governed by cliques? You know that you would be banging your head against the wall, wasting time. City-Suburban merger would enlarge the gene pool and dilute the cliques -- maybe attracting better leadership. It might also encourage more airing of issues. While the Utica City Council can be comical at times, there is at least debate on the issues, unlike the rubber stamping Town Boards. Who would govern an enlarged Utica? Utica voters are notoriously complacent -- which explains why all our regional leaders are now from Rome in spite of Rome having 1/2 the population. If NH and Whitestown became part of Utica, voters from those places likely will run the city. Now think about this: If people from NH and Whitestown ran Utica, how would they govern? Do you think they would put up with bulldozing their orchards or fields for business parks and "town centers"? I don't think so. I think they would try to figure out a way to make THEIR downtown vibrant with business activity instead. Do you think they would turn governance of their sewer system over to a political body (the county legislature) most of whose members aren't even affected by the system? I don't think so. I think they would want to control their system themselves. Do you think they would vote to send their water supply to Verona, knowing that a shortage will occur if their population significantly grows? I don't think so. I think they would want to conserve their water supply for their own future growth. I see only positives from merger - - for Everyone but the Special Interests who control small-town government and the government employees whose jobs would be eliminated. One Hundred Thirty Bucks . . . Neither Reed nor town board members could give specific reasons for the drop — $1 million last year alone — but cited increasing costs and difficult financial times. This, of course, is all hogwash. The Town has been spending like drunken sailors on shore leave. . . . and it would have spent more had some Concerned Citizens not raised an uproar. Reed, who took office in 2006. said he had known the fund balance had gone down, but hadn’t realized things were that bad. Excuses . . . And Mr. Reed will use his incompetence as an excuse to spend even more on a full time Chief Financial Officer . . . not that one will make any difference since the Town spent well into the six-figures for Mr. Basile's accounting expertise and well into the six figures for Mr. Green's legal expertise and still finds itself in this mess. And where was the Town Board in all this? Simply Rubber Stamping whatever they were told to do? Having high-priced help at your fingertips does no good if you have no common sense, are lazy, and arrogant. Unfortunately, the Town gets what it deserves. Until enough residents get off their butts, run for office, circulate petitions, show up at meetings and squawk, those who have something to gain by having connections with town government will place their minions into the open slots. And town government will continue to be run for the benefit of those who will profit rather than for the good of the people. More Fail . . .
"Consultants" have concluded that 8,000 jobs will be added in 25 years up at the Old Oneida County Airport business park . . . if WE the TAXPAYERS contribute only another $61 MILLION! Other developments to lure in new businesses would include building a town center housing restaurants and small retailers within the next six years, and adding recreational fields for the public, said consultant Elizabeth Sargent of Massachusetts-based Sasaki Associates, one of the firms working on the report. Just what we need - another "Town Center" with restaurants and retailers . . . What about the other "Town Centers" we already have that are languishing: Downtown Utica and Downtown Rome? And we need more ballfields, too?? How can it be that now that our regional population has dropped by tens of thousands we need more retail centers and ballfields? More, more, and more stuff -- and fewer, fewer, and fewer of us left to pay for it. County Legislator William Goodman, D-Whitestown, said while the park had a long way to go, he was encouraged by the study’s findings. Yeah, sure, Mr. Goodman ... the public should have a say . . . but you know better, right? This is just more of the same garbage that we've been putting up with for 30 years. "Consultants" hired by EDGE come up with a plan to justify EDGE's continued existence for a generation. Town leaders smugly get city residents to pay via county taxes to encourage more activities to move to where they can be taxed by Town Government, while Town residents put up with a degradation of their environment, more traffic, more crime, etc. . . . and the only people who benefit are those who control Town government and their well-connected buddies. Its time to put an end to all this because it hasn't worked before and certainly won't work now . . . now that we are heading into a depression. The only thing that will attract jobs and businesses is to do away with what has been driving them away: TOO MUCH GOVERNMENT - and its cost. Prune government back. Consolidate suburbs with their cities . . . and throw in with them all authorities and special districts providing traditional municipal services. Assign specific responsibilities to each level of government that is left over -- and allow no overlap or duplication. End all disconnects between those deciding how to spend money and those having to raise it. . . . and end all the special industrial development efforts that require large expenditures of money. The time for reform is NOW. I.O.U.S.A. - The Movie . . . .
"One Nation. Under Stress. In Debt." I was given a DVD of "I.O.U.S.A. - The Movie" and watched it over the weekend. Very well done and entertaining, it was also a frightening and non-partisan exposition of just how much trouble our national leaders have gotten the USA into by spending more than they take in. The movie was originally done last summer before the election, but, unfortunately not in time to prevent the last round of spending of the last administration, or the initial rounds of the new administration. If you care about the country, and are concerned about its and your own future, you will want to watch this movie. Try to get the DVD . . . but if you can't or don't have the time, watch the 30 minute "byte-sized" version on You-Tube. You will conclude that POLITICIANS OF BOTH PARTIES DESERVE TO BE TARRED AND FEATHERED!!! The Down Side of Sewer Credits . . .
A few days ago, the Observer-Dispatch gave a pretty good overview of operation of the "Sewer Credit," a system whereby new sewer connections will be allowed to the County's Sauquoit Creek Pump Station if five times the amount of new sewage is offset by removal of storm water that periodically floods the system. The way this is playing out is that the Town of New Hartford, which wants to add new connections for developers, is paying to fix leaking sewers owned by the Village of New York Mills. This benefits New York Mills' residents in that they are being relieved of part of the cost of maintaining their sewer system. The Town would seem to benefit because a roadblock to development would be removed. This scheme is endorsed on today's editorial page. But there IS a downside . . .
First, the taxpayers in the Town (whether directly through their taxes or indirectly through reallocation of Fees In Lieu of Mitigation) are paying to maintain the Village's pipes, something that they are not responsible for. The "development" ultimately authorized is assumed to benefit the Town taxpayer, but can this be said when the "development" needs police and fire protection, has children that need schooling, and roads that need plowing? More development generates more costs. Any additional taxes recouped get used on these costs. If the "development" is underwritten by a "PILOT" or a "TIF" it may actually be years before the Taxpayers see any contribution toward the increased costs. This sounds like a LOSS to the Town. Second, development that occurs in the Town might be a disincentive to redevelopment in the Village. While Village leaders might not see vacant parcels in their midst, there, no doubt, are underutilized parcels because VILLAGE POPULATION HAS DROPPED. The Village's "win" might not be that golden. Lastly, and most importantly, the Sewer Credits encourage sprawl, something that costs the entire region money. Village and City residents have to maintain an infrastructure built to support much larger populations than present while Town residents must build new infrastructure. It just doesn't make sense. Those Pernicious Pensions . . . In May, 2008, the Albany Times Union created a sensation when it revealed that almost 900 people, including state officials convicted of crimes and retired police officers, were receiving $100,000 or more annually in retirement benefits. The following August, the Buffalo News noted that a local school superintendent retired with an annual pension of over $205,000, more than his former pay; that a local math teacher retired with a pension of more than $90,000 per year, about equal to his pay; and that statewide almost 700 teachers and administrators had retired with six-figure pensions. These are the exception rather than the rule; however, to many who are not on the public payroll, and to those who rely exclusively on Social Security, even average government pensions look generous. Newsday recently reported that newly retired teachers state-wide last year received almost a $46,000 pension (almost $72,000 for those with 35 years on the job), police and firefighters about $58,000, and state and local workers almost $25,000. The reason why everyone is focusing on pensions now is the nation's economic crisis and the state's fiscal crisis. In early March the Associated Press reported Comptroller DiNapoli's estimate that the state's pension fund had lost about 20% of its value last year and that losses were continuing. People who are not on the public payroll expect that they will probably be taxed more to finance government pensions, while watching their own retirement nest-eggs disappear. In fact, they need to know that Article V §7 of the New York State Constitution forbids any diminution or impairment of these pension benefits, while Article VII §8(2) allows benefits to be increased. Article XVI §5 exempts the benefits from state taxes. Pension benefits for existing employees are iron clad. Even before the current crisis, taxpayer costs for public pensions in New York State were rising dramatically: from around one billion dollars in 2000 to 6.7 billion dollars in 2005. If the financial meltdown continues, there is a real chance that basic governmental services will have to be curtailed, while taxes are dramatically increased just to cover pension obligations. Pension benefits have long been an enticement to public employment. Government employees did not expect to get rich when they joined the public payroll 20 or 30 years ago. They often accepted less pay than their peers in the private sector in return for greater job security, a predictable career path, more time to be with family, health benefits, the satisfaction of doing public good, and a secure retirement. Times have changed, however. In our area, most of the better paying jobs in the private sector (excluding health care, which is supported by insurance premiums similar to taxes) have simply vanished, owing to an inability of employers to compete in a national, and later, a global marketplace. The level of taxation necessary to maintain legions of public employees contributed to New York's private employers' inability to compete with those elsewhere. Public employees, however, have been insulated from this competition, protected by laws, rules, and powerful labor unions (some more “effective” than others). A comparison of public school teacher salaries with those in private schools, or with the salaries of government lawyers and engineers having a less powerful union, is a sobering demonstration of how the strongest public employee unions use their political influence to distort the labor market. Now, the better-paying jobs are more often the public jobs, but there is no longer a healthy private sector to sustain them. A big problem with public employee pensions is the manner in which benefits are determined. Usually benefits are calculated as a multiple of the years worked times the average of the highest three years of compensation. While this approach lends itself to prediction of the cost of the pension for those civil servants who follow the typical progression up the career ladder, there are simply too may ways for some to artificially inflate their “high three” years far above what their careers would justify. For example, the Buffalo area superintendent mentioned above seldom took vacation and sick time. The pension rules applicable to him allowed him to cash in literally hundreds of days of leave during his last year on the job, inflating his final salary to almost $534,000. The Buffalo News calculated that this added almost $53,000 to his annual pension benefit, allowing him to retire on a pension that was bigger than his salary. Had he simply collected the value of the leave by remaining on the payroll longer in leave status, no increase in pension would have occurred. Those who can control their overtime are also in a position to inflate their “high three.” Stories of police officers doing things of little value such as washing police cars to burn overtime have been urban legends for years. Teachers have been suspected of inventing after school clubs and activities to obtain advisor stipends that increase base pay. While school boards consider the immediate annual cost in their budget when the club is in operation, they often fail to consider whether or not the timing of the stipend will result in a permanent increase to the teacher's pension. Employees, even part time employees, who have political connections can sometimes use them to get themselves appointed to positions paying far above their normal pay. It only takes 2 or 3 years in a political position to significantly increase a retirement benefit for the rest of one's life. Recently the Town of New Hartford approved a payout of almost $72,000 for several years of alleged back overtime to a bookkeeper who, according to Town Board minutes, was originally hired as an “exempt” employee (a category not usually eligible for overtime). This person's 2008 pay zoomed from $50-something thousand to about $128,000, due to the overtime payment. Did the Town Board consider the probable long-term cost of this “one shot” deal to the taxpayers for pension benefits? Could the payout have been structured to take place over time to avoid pension consequences? There is no evidence that these considerations were even on the Board's radar screen. Employees, who engage in these “inflation” techniques, feel that they are entitled to the resulting pension benefits because the rules of benefit calculations allow it. Managers that may be in a position to minimize abuses, either do not see conservation of tax dollars as their responsibility, or they are in a position to benefit from the abuse themselves. But are these practices fair to the taxpayers – or fair to other employees who do not engage in them? The typical employee who retires has years of contributions into the system, either by him or herself, or by the employer on his or her behalf, at levels commensurate with earnings that gradually increase to the “high three.” Over the years, a substantial amount of contributions would have built up to pay for this person's pension. With an inflated “high three,” however, the money is NOT already in the system. That means that money either must be reallocated to the inflated pension from the contributions made for our typical employee, or the taxpayers must make up the difference. In the case of the superintendent, the $53,000 additional benefits per year for two or three decades of retired life would be a significant burden on the taxpayer. That money could otherwise be used to hire another teacher. The benefit formula, in a sense, allows some to take contributions intended for others. It is easy to see how just a few of these bad apples can threaten the viability of the pension fund or ruin budgeting for years to come. During the fiscal crises of the '70s and '80s, the state placed new hires into “tiers” with scaled-back benefits. Although the unions argued that it was unfair for two people doing the same job to have different benefits, this was necessitated by the constitutional prohibition on cutting benefits for existing employees. As the economy improved and the value of pension fund investments increased, there was pressure to both increase benefits for those in new tiers as well as to scale back contributions. Around 2000 Gov. Pataki and the State Legislature not only eliminated a requirement for employees to contribute 3% of their salaries into the system after 10 years, they allowed pensions to vest after employees had only 5 years on the job, instead of the 10 years previous. That opened the door for many relatively short-term political appointees to obtain long-term benefits from the pension system – another form of political patronage. Once increased benefits are given, the constitution prevents them from being cut. What can be done to control pension costs? One thing proposed by Governor Paterson is the creation of another retirement tier, Tier V, that will increase retirement age to 62 from 55, require employees to contribute 3% of their pay throughout their employment, return pension vesting to 10 years, and eliminate overtime when calculating pensions. Unions will scream “unfair,” but what is going on now is unfair. These changes, however, will only apply to new employees. For existing employees, our public leaders need to keep pension benefits on their mind when taking any action that involves personnel. For example, was overtime and the impact on pension benefits ever considered when Utica decided to go into the ambulance business – or considered in the latest police contract? Overtime needs to be carefully regulated. Payouts for accumulated leave or other benefits need to be structured over a period of time to avoid a pension impact. Pension costs are posing great peril for the taxpayers. The public needs to be aware of the problem and demand that it be brought under control. Partisan Potshots . . .
Sen. Griffo has joined other Senate Republicans in taking potshots at Gov. Patterson's proposed changes to the Empire Zone program. They are Phony Fiscal Conservatives. The public recognizes the Empire Zone program as being rife with abuses and an outright failure at being a job producer. If Mr. Griffo et al aren't going to push to simply end the program all together, the least they can do is support Gov. Patterson's proposals to curb it. Police Expansion ... For What? Per the OD, "City police might use Washington Courts building." OK, let me get this straight ... The city's population has been cut in half . . . Substations have been, understandably, opened on Varick and James Streets because of specific neighborhood problems . . . But the police still need to expand into another new location? Sorry, but the need is not apparent . . . Taxpayer dollars need to be conserved. Furthermore, locating a police facility in a prime area that is ripe for redevelopment does not seem to be a good marketing move. Put The Students First . . . Per today's OD, New York Mills is considering raising the mandatory school attendance age to 17 from the current 16. Supt. Houghton hopes this will get more kids to graduate. Encouraging more students to graduate is certainly a good thing. The High School Diploma undoubtedly is the ticket that will open many doors in the job market . . . Employers often won't look at prospective employees without one, because they presume that the diploma represents a certain level of competency. But competency is JUST A PRESUMPTION. How many times have you heard stories about high school and even college graduates who cannot perform basic math or writing tasks? This has become a too common experience for many. Now NYM wants to force students who would otherwise drop out to stay an extra year. . . . Will it be an extra year of knowledge? . . . or an extra year of group activities? . . . or maybe an extra year of indoctrination? Other than an admission ticket to potential job interviews, what exactly will the student get out of an extra year of school --- and is it worth staying for? The student is actually in the best position to answer this question because he or she is living the school experience day to day. Sixteen was always thought to be the age where students were capable of making such decisions. Are NYM students different from students elsewhere? Is the school district saying that 16 year old students in NYM are not capable of deciding for themselves? Students drop out when they do not see value remaining in school. That, in turn, says something about the school district's performance. . . . and it is the reflection on school performance that seems to be what is motivating Ms. Houghton. Raise the mandatory school age, decrease the drop out rate, and make the school district look better. However, students who are effectively held against their will often become disruptive, interfering with other students' education. Students who do not see the value in education may need to be out in the "real world" for awhile to appreciate it. . . . and when they do, they will work that much harder when they come back for their GED and actually learn something. Some students learn better outside of the public school system. NYM should think less about raising the mandatory age, and more about what may be driving its drop out rate. Put the students, not the school district's reputation, first. What's The Point . . .
. . . to what will be a series of articles in the O-D about Utica's "Sin City" days? People on the street have long felt that the Observer-Dispatch has been instrumental in Utica's decline, and the statement above corroborates this belief. If the reporting then was "lastingly injurious" to Utica's economy, why is the Observer-Dispatch dredging up all this old material now, when it is no longer news . . . or relevant? What motivates the Observer-Dispatch's periodic dredging up of Utica's mob-plagued past? We were just "treated" to this bullcrap last September. Is it Ethnic bias? Anti-Utica bias? Perhaps the series of articles about Utica's past is intended to distract from, and the statement above is an excuse for, not exposing what is going on in New Hartford and Oneida County. Or perhaps the O-D is simply being lazy, repackaging an old product, content to stake it's current reputation on 50-year-old laurels -- which are starting to stink. Whatever the O-D's purpose, it fans the prejudices of the past, preserves the status quo of the present, and gets in the way of moving forward with Greater Utica's future.